Solidarity members will begin strike action at Sasol this coming Monday because of the company’s staff share scheme that excludes white employees. This will be the first time in the history of South Africa that white employees strike because of racial exclusion. 89% of Sasol workers in Sasolburg and Secunda voted in favour of industrial action. Sasol recently introduced a new staff share scheme, Khanyisa. In terms of this scheme, white workers and foreign nationals are excluded from this 10-year scheme. Khanyisa follows a previous scheme, Inzalo, that did include white employees. Inzalo will now be concluded in the first phase of Khanyisa. However, white persons are excluded from the second phase, which will be the new scheme for the next 10 years. Sasol therefore had a history of inclusion, but now it has a future of exclusion. According to Solidarity Chief Executive Dr Dirk Hermann, in practice the new scheme implies that a Sasol employee with 30 years’ service at Sasol will receive nothing while someone who has worked at Sasol for only three months will receive share value of R500 000. The draft Mining Charter also stipulates that white employees may not be excluded form staff share schemes. Therefore, Sasol’s scheme is in direct violation of the mining empowerment charter and the general practice at mines. The strike begins on Monday with several protest actions. It will build up to Wednesday when a national day of support for the Sasol workers will be held. A complete strike begins on Thursday with a mass meeting of the community at the Secunda plant and the Sasol coal mines. The focus will then shift to Sasolburg and later both industrial plants and the Sasol coal mines will stage joint actions. “We have already planned for three weeks of industrial action. However, this will be a clever strike. Our 6 300 members are highly trained employees of major strategic importance to Sasol. We intend to switch off a different section of Sasol each day by means of well-laid and strategic plans. We have the knowledge and influence to achieve that. 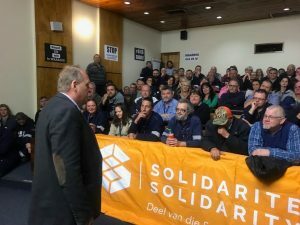 On Wednesday, Solidarity will hand over hundreds of memorandums of support for the Sasol employees at various companies. Employees at inter alia Eskom, Telkom, Denel, several mines, ArcelorMittal, the SAPS, agricultural cooperatives, aviation companies and many more will hand over memorandums on Wednesday. One of the biggest such events will take place at Sasol’s plant in Sasolburg. Solidarity is also calling on South Africans not to fill their tanks at Sasol petrol stations this coming Wednesday in support of the Sasol employees. People are also encouraged to wear blue on that day. Meanwhile, Solidarity applied to Nedlac for permission for its members to launch legal protest action at hundreds of employers in South Africa in solidarity with the Sasol employees. Nedlac refused to give permission, therefore Solidarity intends to go to court next week to take Nedlac’s decision under review.